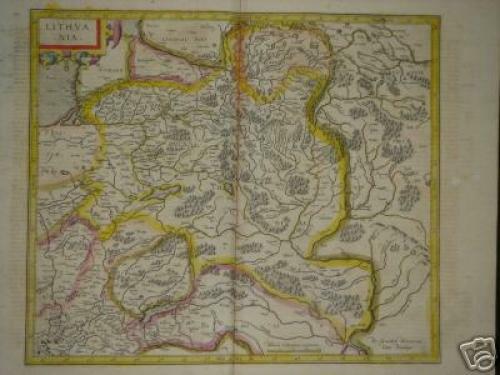 An elegant map of Lithuania, with parts of Poland, Prussia, Ukraine and Belorus, from the Mercator-Hondius atlas. This is one of the maps which includes Gerhard Marcator's name as the map maker. Coverage extends from the Baltic, including part of Prussia, to the Carpathian mountains at the headwaters of the Vistula in the southwest, confluence of the Bug and Dniepr Rivers in the Southeast and the headwaters of the Volga in Belorus. The map is centered on Lithuania and shows many cities, towns, rivers, mountains, forests, lakes, etc. In very good condition, slight text show through from the verso.